BRAVE boys and girls! We all wish to be brave, do we not? Then we must learn to say "No," when tempted to do something wrong. 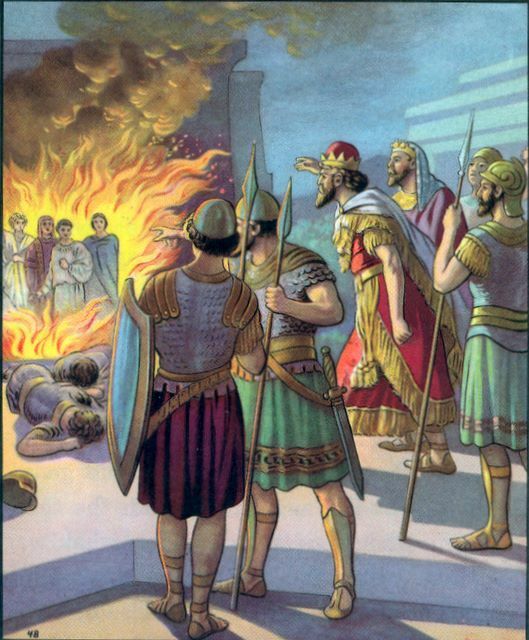 These Hebrew boys were young nobles who had been carried away captive from Jerusalem to Babylon; but though in a strange land, and subject to the mighty king Nebuchadnezzar, they feared not to refuse his food and wine when they knew that the taking of it would cause them to sin against God. They were well educated Hebrew youth, and the Babylonian king had commanded that they should be taught in all the learning of the Chaldeans ("Chaldeans" is another name for the Babylonians at this time.). Also, in order to keep them fit and healthy, and with beautiful countenances, he had ordered that the meat and wine from his own table should be given them. Their names were Daniel, Hananiah, Mishael, and Azariah. Daniel seems to have been their leader. We find "he purposed in his heart that be would not defile himself with the portion of the king's meat, nor with the wine which he drank." So he begged the king's servant to feed him and his three companions on plain food and pure water; but the servant feared to do so, lest the king should find them worse looking than those who ate his meat and drank his wine, and the servant should lose his head because of it. A trial was made, however, for ten days, at the end of which time they were found to be looking better than the boys fed on rich food and wine. Therefore, the servant let them live plainly according to their request; and at the end of three years, when they stood before the king, we are told that for wisdom and understanding none were found like Daniel, Hananiah, Mishael, and Azariah. The last three of these are sometimes called Shadrach, Meshach, and Abednego.